And besides the front door? 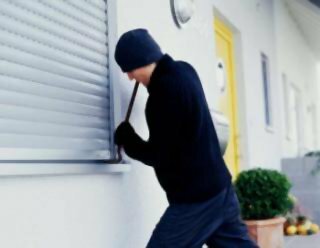 The front door is the first thing we think about when it comes to preventing unwanted intruders, but a large number of the burglaries occur by passing through other access, such as windows. Once you have ensured that the main door is sufficiently protected it is essential to do the same with every potential entrance point. When designing the security of your home it is therefore necessary to take into account all possible access points. 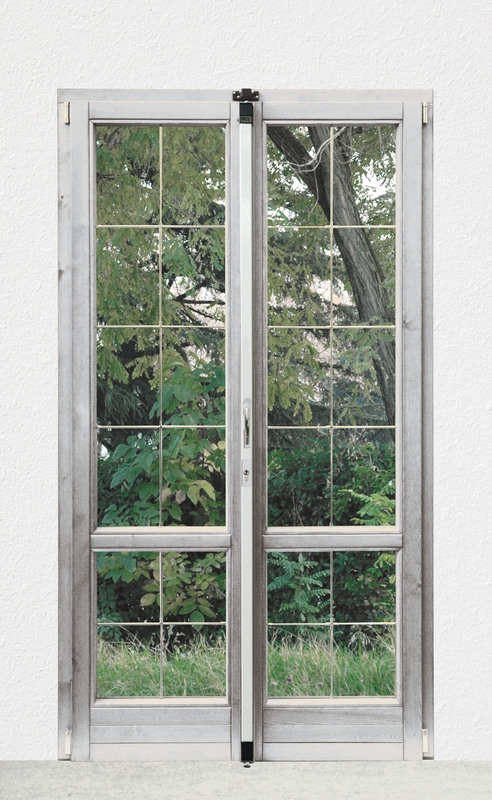 The windows and patio doors can be effectively protected with shutters, armoured blinds or locking bars, but also with electronic alarms, as can all secondary entrances to the house, such as cellars, garages, skylights on roofs etc. As we have already pointed out, an electronic alarm system is not sufficient and does not replace the mechanical protection, although it does contribute to increasing the security of the house. Let’s see which security system could be the most suitable, depending on the type of access. The first rule is perhaps the most obvious, but also the one to which less attention is paid, precisely because it is taken for granted: do not forget open windows or garage doors. Sometimes you might close the main door with a double throw and calmly leave, forgetting, however, to check that every other access to the house has actually been secured, thus leaving a potential “free entrance” for the burglars. Second rule: if possible, make sure that shutters or blinds are securely locked from the inside. 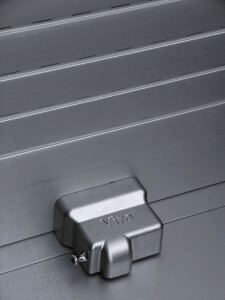 If this is not the case, you should install a universal locking bar, which is the ideal solution in this case, because it not only acts as reinforcement for shutters, blinds and up and over doors against breakage, but also offers excellent protection against various burglary tools, such as drills. Universal locking bar applied to a patio door. Particular attention should be paid to the garage door, which has been discussed previously: leaving cars, motorcycles or valuable equipment inside the garage, if this is not effectively protected, is paradoxically almost more dangerous than parking them in the street. In fact, a thief who gains easy access inside the garage has time to act, hidden from the sight of neighbours. If then, as happens in many cases, the garage is connected directly to the house through a normal door, the risk increases exponentially. If the garage is closed by a shutter or by an up and over door, additional security, with respect to the locks originally installed, which ensures effective protection, is represented by the “New Condor” fixing unit, ready for use with any European half cylinder and equipped with a steel one-piece body, programmed breakage lock-bolt head and rotating anti-drill plate; the New Condor can also be installed on up and over doors by using a simple accessory. 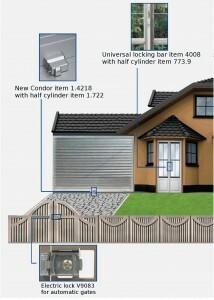 New Condor applied to a shutter. 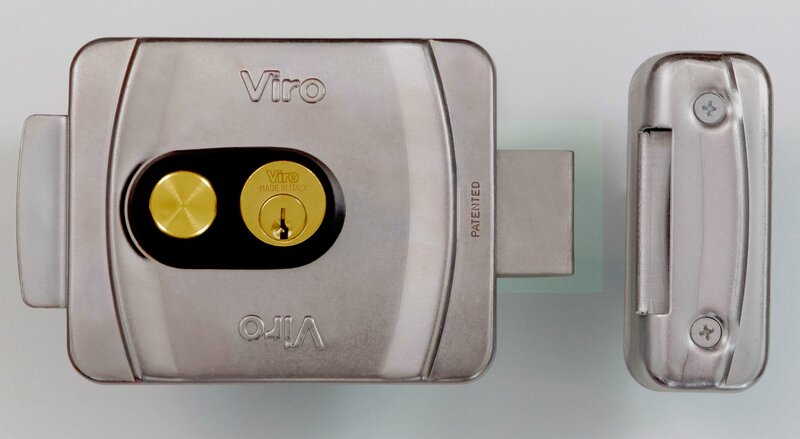 Also, if you do not already possess an electronic alarm system, Viro M.A.C. can control the accesses to your garage or any door and/or window, sending a text message directly to the owner’s mobile phone. All the possible uses are illustrated in this blog. Last but not least, access to house often passes through gates (pedestrian or vehicular) located in the courtyards and gardens. These are small gates in homes with gardens, doors in condominiums and double or sliding gates in the case of accesses to parking areas. 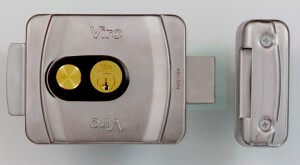 In all these cases, a good solution is the installation of an electric safety lock, such as the V9083 or V09 which, thanks to their construction and operational features, carry out protection functions and are also suitable for installation outdoors, where they are subject to severe climatic conditions. We have seen that it is essential to ensure adequate protection for each access to your home, without forgetting that a good relationship with our neighbours and some simple precautions, such as never forgetting, before leaving, to check that all accesses are closed, and not letting the mail accumulate in the mailbox for weeks – which can be essential to deter unwanted intruders. This entry was posted in Locks and Cylinders and tagged home, products, technology, tips on 19 January 2016 by calessandrini. It’s important to make sure that other access points for your home or business are also secure. Many intruders and thieves will ignore the front door altogether and try things like windows, garage doors, or back doors; as you mentioned. Having security doors for your other home entrances can ensure that potential thieves can’t get in no mater which door they try.